Last Tuesday, indigenous leaders, affected residents, and State Representative Derrik Lente met with the Bureau of Land Management (BLM) State Director Amy Lueders to request she cancel the January 2017 Chaco oil and gas lease sale. Over 150 people rallied outside the meeting in solidarity and delivered over 17,000 signatures in protest. This Tuesday, you overwhelmed Director Lueders office with phone calls demanding cancellation of the irresponsible sale. Yet, the BLM went forward with the sale anyway. 843 acres of public lands in Greater Chaco were leased yesterday for nearly $3 million. They failed to listen to the citizens they represent. They failed to listen to the Indigenous people who call those lands home. They failed to safeguard the air, land, and water resources they are charged with protecting. They failed to act in the interest of a clean and just future. We lost a battle for Chaco, but the fight is far from over. 91% of public lands in northwest New Mexico are already leased to oil and gas drilling. Right now, the BLM Farmington Field Office is amending their resource management plan (RMP), which informs all leasing decisions. They are asking for public comment on the RMP amendment until February 20th (Learn More). This is our chance to demand an end to ALL leasing in northwest New Mexico. We can ensure that lease sales like today’s stop all together. We must show up and make our voices heard. 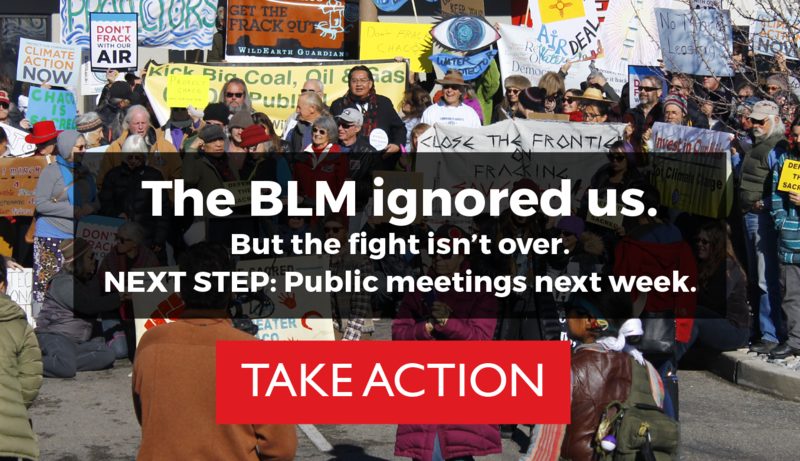 At the first public meeting in Shiprock, NM last fall the BLM refused to take public statements from local people and walked out of the meeting. They’ve rescheduled the Shiprock meeting and added an additional meeting in Farmington, NM. NOTE: If you can’t make it to the meeting, submit written comments here, talking points provided.